If your school is registered with SCHOLAR, you should automatically gain access to your registered subjects. Individual student accounts are sent to your school - you can find out your personal log-in details from your teacher or the SCHOLAR contact at your school. Are your registered courses available in SCHOLAR? See the list of all available SCHOLAR courses and find out. Once you have logged in successfully, you will see a list of your registered courses. In addition, you will also have access to supporting course content at a lower level (where available) as well as some support materials. You will have access to a 'Succeed with SCHOLAR (Student)' course. This provides a number of 'How to' videos to get you started with SCHOLAR. These videos can also be accessed on YouTube. We deliver online tutor sessions to help with your revision; these are interactive events hosted by subject specialists with extensive teaching experience. 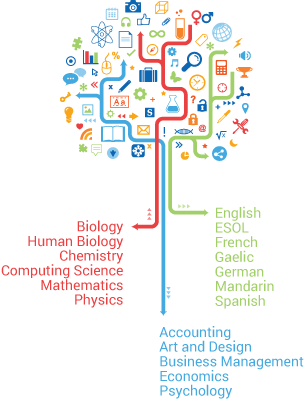 We currently cover Biology, Chemistry, Computing, English, Human Biology, Maths, Modern Languages and Physics. Each session lasts up to an hour in total, including time for questions and answers towards the end. Alternatively, if you would like a PDF version of the online materials, your teacher can provide this for you. For any further queries, please get in touch. If your school is registered with SCHOLAR, you should automatically gain access to your taught subjects and associated class details. Individual teacher accounts are sent to your school - you can find out your personal log-in details from the SCHOLAR contact at your school. The Overview Account is also available to staff members to preview all SCHOLAR subjects. You can also retrieve the log-in details for your students from My SCHOLAR / Password Admin - please circulate these as soon as possible so your students can start using the SCHOLAR materials. Once you have logged in successfully, you will see a list of your registered courses. In addition, you will also have access to supporting course content at all levels as well as some support materials. You will have access to a 'Succeed with SCHOLAR' course. This provides a number of 'How to' videos to get you started with SCHOLAR. These videos can also be accessed on YouTube. Training on using SCHOLAR is available for staff and students. All events are provided free-of-charge and can be delivered face-to-face or online. Training is tailored to your staff and student requirements. Contact your Education Authority's SCHOLAR Consultant to organise an event for your department or school. Alternatively, you can download a PDF version of the online materials from our site - see 'Study Guides' under the Resources menu of a course. No action is required for SEEMiS schools as SCHOLAR registration is done automatically. If your MIS information is up to date, your staff and students will have a valid SCHOLAR account from June onwards. SCHOLAR will notify the SCHOLAR Contact at your school by email when these are available in June. There is also an Overview Account available for staff members to preview all SCHOLAR subjects. Please contact the SCHOLAR Contact at school in the first instance regarding access to SCHOLAR as they will most likely be able to assist you. If you are not in a SEEMiS school, please see the Registering with SCHOLAR section or contact the SCHOLAR Contact at your school. Once successfully logged in using the Overview Account, you will see a list of all SCHOLAR courses. If logging in with a personal account, you will see a list of your registered courses as well as some support materials. Students and teachers have access to a 'Succeed with SCHOLAR' course which provides a number of 'How to' videos to get started with SCHOLAR. These videos can also be accessed on YouTube. All 32 Education Authorities in Scotland subscribe to SCHOLAR. If your child's school is registered with SCHOLAR, they should automatically gain access to their registered subjects. Individual student accounts are sent to the school - if your child has not received their log-in details, encourage them to ask their teacher or contact the SCHOLAR contact at their school. You can view a sample of our learning materials or get in touch to request a parent password. Once logged in successfully, your child will see a list of their registered courses. In addition, they will also have access to supporting course content at lower levels (where available) as well as some support materials. A series of 'How to' videos are available in the 'Succeed with SCHOLAR (Student)' course. This will help your child to familiarise themselves with the SCHOLAR site. These videos can also be accessed on YouTube. Tailored training on using SCHOLAR is available for staff and students. All events are provided free-of-charge and can be delivered face-to-face or online. You may also come across our SCHOLAR Consultants at parents' evenings if they have been invited by your school. Alternatively, if your child would like a PDF version of the online materials, their teacher can provide this for them. SCHOLAR will need the following information from every school before the system will accept registration information. Data marked with a * are essential. More detailed information on registration is available in the data specification pdf and the subject codes pdf. The School Contact is the point of contact for the registration process at the school. They will be notified by email when new students and staff accounts are created. The School Contact is also given a user name and password to log-in to SCHOLAR, and download the usernames and passwords for the students and staff at their school. Each local authority has a SCHOLAR Consultant who works closely with the authority representative to identify the needs and priorities of their schools. There is also a SCHOLAR Consultant dedicated to the FE College Sector. The SCHOLAR Consultant delivers training for staff and students in the effective use of SCHOLAR. The format of each event is agreed in advance and varies to suit individual requirements. All events are delivered free of charge and are part of the contract between Heriot-Watt University and the local authority. To request a staff or pupil event, please fill in the following form. Thank you for your message. Your SCHOLAR Consultant will be in touch with you soon. There has been a problem sending your message. Please email SCHOLAR Technical Support. Thank you. Area of responsibility: Aberdeen City, Aberdeenshire. Area of responsibility: Angus, Fife, Perth & Kinross. Area of responsibility: Argyll & Bute, East Renfrewshire, North Ayrshire, South Ayrshire. Area of responsibility: Clackmannanshire, Falkirk, Stirling, West Lothian. Area of responsibility: Dumfries & Galloway. Area of responsibility: East Ayrshire, East Dunbartonshire, Inverclyde, Renfrewshire, West Dunbartonshire. Area of responsibility: East Lothian, Scottish Borders. Area of responsibility: Edinburgh, Midlothian. Area of responsibility: Eilean Siar (Western Isles), Orkney Islands, Shetland Islands. Area of responsibility: FE College Sector. Area of responsibility: Highland, Moray. Area of responsibility: North Lanarkshire, South Lanarkshire.